And we're back! 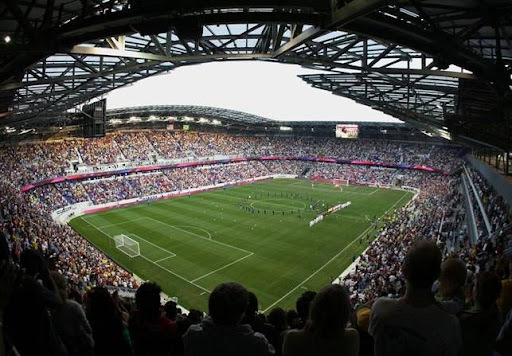 It's opening day @The Cathedral of Football, Red Bull Arena (built by Makita) and the 0-2 Red Bulls are taking on the 2-0 Colorado Rapids (4:00pm, ESPN, ESPN Deportes, ESPN3, 1190 AM radio, match notes here). With the Red Bulls on the brink of what would be a catastrophic 0-3 start, let's see how both teams come into this one. The Red Bulls, a team that has not had a creative clue in the midfield this short season, will look to snap their slide right here, right now. Their plans to turn Red Bull Arena into a fortress would be shot down in flames if they take anything less than all three points on offer today. With Luke Rodgers still an uncertainty and a recent injury to Juan Agudelo, RBNY has only two experienced forwards (Henry and Cooper) on the roster. Can the return of Rafa Marquez help end the string of silly individual mistakes that have cost the Red Bulls two losses this young season? Can RBNY keeper of the future Ryan Meara continue his fine form? Will the return of Conde shore up RBNY's Keystone Cops defense? Will rookie Connor Lade make his debut and take the starting left back spot from the horrible Roy Miller? We await the answers to these questions with great interest. The Colorado Rapids are coming off an impressive 2-1 road victory, against Philadelphia. More impressive was that the Rapids held on down to 10 men. This week, the Rapids will be without stalwarts Pablo Mastroeni and Jeff Larentowicz. Can the Red Bulls take advantage? We will soon find out. Things look pretty bad right now for the Red Bulls, but I like them to put in a much more convincing performance in their home opener. Colorado will be without both Jeff Larentowicz and Pablo Mastroeni, while we should be getting Rafa Marquez and Wilman Conde back. I think our midfield will function better and we will win handily - 2-0. Goals from Henry and Dane Richards. I'm calling it: 3-0 Red Bulls victory. The desperate Red Bulls will pull this one out in fine fashion with a convincing goleada of the hapless Rapids. Here's hoping, anyway. With Colorado missing Mastroeni and Red Bull-killer, Jeff Larentowicz, it gives us a chance to tie. 1 point after three games should be enough to put us in a playoff position in the Eastern Conference, so that's not so bad, right? 1-1 tie as the spine of our lineup starts to shape up with Rafa and Conde. Hopefully this will be the beginning of the team finding its way. I woke up Friday feeling unnaturally optimistic about Sunday's home opener. At first I thought it might be the unusually warm weather, but there are some better reasons to think that RBNY will come away with a win: 1) Colorado's two wins have come against weaker East teams, so their record may not be reflective of their true quality. 2) The Ginger Assassin, Jeff Larentowicz, along with 100-year-old man Mastroeni, will be riding the pine. 3) Kenny Cooper will surely get the start, so RBNY should get 60'+ , which should allow him to really get stuck in. 4) RBNY players have something to prove. They know the fans are already disappointed and I think they'll be fighting to change some minds. There's also the return of Rafa - a wild card who could light a fire or completely blow up the fragile team chemistry. I can't spend 2 days expecting the worst, so I'm going with a 2-1 RBNY victory with goals from Cooper and Henry. Alrighty then! Look for our Award Winning coverage in the next day, or two. Today, I hope to see you all @The Cathedral of Football, Red Bull Arena (built by Makita). Viper Out!